You wouldn’t think the on-going manhunt in Boston would lead to bad management decisions, but it does. Many of the firms in the Boston suburbs have employees who live in the affected areas. This leads to a decision about whether or not to open. This is a cop-out of the highest order. (excuse the pun) Employees should not even have to make the decision. The company, if it’s really worried about the safety of employees, should just close up for the day. Why force your employees to make a tough decision and worry about whether they will be docked for a day’s pay. Why create an artificial division between those who ‘made it in’ and those who felt better staying home – whether they were in the affected area or not. This is just bad management from a firm which seems more concerned with it’s own liability than its employees. I’ve lived in the Bay Area for 18 years, but Boston will always be my home town. I was in San Francisco during 9/11 and while I had visited New York often, I had only been to the World Trade Center once. I grieved for the loss of life but it was still an event that happened to strangers. But I’ve walked down Boylston Street in the rain, the snow, and on a crisp Spring day like yesterday. I’ve watched the beginning of the Boston Marathon in Hopkinton and the end, just yards away from yesterday’s explosion. 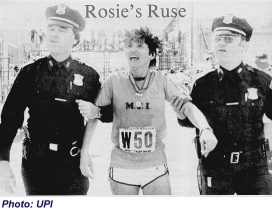 I know who Bill Rodgers is, why John Kelley-the elder – is a Boston legend, and who first suspected Rosie Ruiz was a fraud. I’ve waited in the lobby of the Lenox Hotel -before it was remodeled and became respectable. I know that the area is called Back Bay, because it used to be a bay until our colonial forefathers decided they needed more land for their cows to graze. And yes, until recently, I loved that dirty water, because Boston was my home. I’ve been to the Patriots Day game at Fenway Park and walked down to the see the finish of the race, and then walked back to Fenway for the second half of what used to be a day-night doubleheader. I can tell you the name of every store, bar, restaurant, gallery or hair salon that you pass walking from Boston Public Garden to Mass Ave. I can remember my mother teaching me the names of the cross streets to help me learn the alphabet-Arlington, Berkeley, Clarendon, Dartmouth, Exeter, Fairfield, Gloucester and Hereford. I know where Dorchester is and the neighborhood where 8-year-old Martin Richard lived and I’ve been to Revere where police searched an apartment for clues. I’m happy when the A’s , Giants, or 49ers , or Warriors do well, but I FOLLOW the Bruins, Celtics, Patriots and Red Sox. I’m sorry, but it’s part of me. I guess that’s why yesterday’s events have a much greater impact. The Marathon will no longer be the great fun-loving, 26-mile event that it once was. Security will be tighter, everyone will be on edge. Parents won’t let their kids take the T into town to watch the end of the race and Sox fans will think twice about walking to Copley Square to see friends cross the finish line. I know the city will recover. New York has recovered – mostly. But, when I visit Boston later this year and walk down Boylston Street once more it won’t be the same, and that’s what really pisses me off.